Many people just dream of exploring the world, experiencing different cultures and meeting different people. I make them all happen. My journeys are all about exploration and the sense of wonder that I feel at the immense diversity of our surroundings. My urge to travel is very strong as I always felt that if there is a will, there is a way to travel. Going back to nature to see and experience the miracles of mountains and hills is something that interests me. 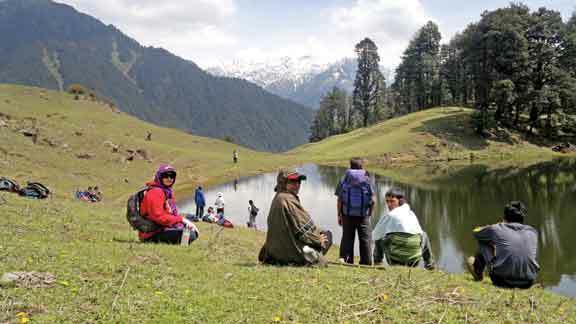 I started trekking when I was in the seventh standard in school. At Kendriya Vidyalaya, in Bengaluru, where I studied, I joined the Scouts and Guides movement, and this association gave me my first opportunity. Later on I started trekking alone and gradually my friends asked me to take their children along with me. Apart from the school academics, travelling become a passion, a priority. Each journey taught me to understand nature, to connect with the earth, and showed me how truly ‘incredible’ the world is. I like the Himalayas more than the beaches and I feel I am a Himalayan after each of my trips there during the month of May every year. Walking amid the heights, overcoming all the difficulties on the way, are unique lessons which cannot be gained from any books. Drinking the fresh water that falls through the valleys, watching the full moon are a few unforgettable experiences I had. I tell people who accompany me on the trips to ”come along with me, I can take you to the hills, villages and forests but only you are responsible for yourself”. Self-confidence and will power are the two things that I carry along in my travel kit. Meeting different people and sharing their experiences was something I learnt during the trips. I learnt that each person is unique. During these trips, there are people who complain saying it is difficult for them to sleep in tents and to cope with the limited facilities in trekking camps. But, later the same people thank me, saying that I gave them an opportunity to experience things they had not noticed before. One incident has stayed in my mind from one of my Himalayan treks. Baljeet was a cancer patient who was very keen to visit the Himalayas. We became aware of her condition rather late and I tried to talk her out of the trip. But seeing her confidence and deep desire, I did not have the courage to deny her this last wish. ”Forget the limitations and do it” was the message she conveyed to us when she breathed her last after fulfilling her wish. Madhya Pradesh is another place which is close to my heart. I travelled deep into the heartland, experienced and witnessed rural life in all its bareness and beauty, lived with the villagers and learnt first hand that India truly lives in its villages. Somebody once asked me what I would like to do in my life and I had replied ‘just travel’. This dream has come true and as I travel, I realize I have become a more interesting and engaging person. I have developed an appreciation for different cultures and lifestyles and I truly feel a sense of accomplishment. I was born to be a traveller.